Around the world, most publics believe global climate change is a pressing concern. A median of 54% across the nations surveyed say it is a very serious problem, while fully 85% say it is at least a somewhat serious problem. In 22 of the 40 nations surveyed, half or more believe that global warming is a very serious challenge. And majorities say it is at least a somewhat serious problem in every nation surveyed. Despite such overwhelming concern, worries about climate change vary substantially by region and country. Concern over climate change is especially high in Latin America, where a median of 74% think it is a very serious problem. Roughly six-in-ten or more in every Latin American nation surveyed report substantial concerns about climate change. In Brazil, home of one of the world’s largest carbon sinks, 86% believe climate change is a very serious concern. Three-quarters or more in Chile (77%) and Peru (75%) express very serious worries about the threat of global warming. Both nations have been affected by recent weather extremes, including flash flooding and landslides earlier this year. 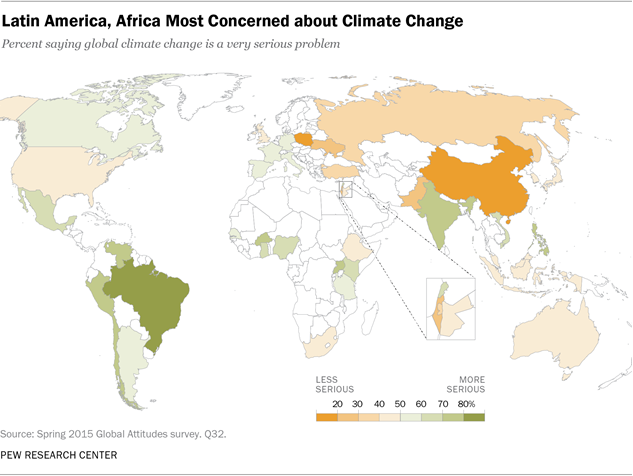 Sub-Saharan Africans also voice substantial unease about climate change. A median of 61% say global climate change is a very serious problem, including majorities in seven of the nine nations surveyed in the region. Anxiety is especially high in Burkina Faso (79%) and Uganda (76%), while Ethiopians (40%) and South Africans (45%) are less worried. Europeans are, on average, somewhat less concerned about climate change; still, a median of 54% say it poses a very serious problem. More than half of French (56%), Italians (55%), Germans (55%) and Spanish (53%) express substantial concerns, but just 19% of Poles consider global climate change a critical issue. In the U.S., 45% believe global climate change is a very serious problem. One-in-four Americans do not consider climate change to be a serious problem, one of the highest shares of all the nations surveyed. Only Israelis (30%) and Russians (26%) are more likely to say that climate change is not a serious concern. Fewer than half in Asia (median of 45%) and the Middle East (median of 38%) express significant concerns about climate change. In Asia, however, anxiety about climate change varies widely among the nations surveyed. About seven-in-ten or more in India (76%), the Philippines (72%) and Vietnam (69%) are very concerned about global warming, while just 18% say the same in China. Concern is relatively low throughout the Middle East: With the exception of Lebanon, at two-thirds, fewer than half in every country surveyed believe that climate change is a very serious concern. Ukrainians and Russians are among the least concerned about global climate change. Roughly three-in-ten in each country say it is a very serious problem. While many believe that global climate change poses a very serious threat, in many cases views on this issue have not changed over the past five years. Of the 20 countries surveyed by Pew Research Center in both 2015 and 2010, a median of 47% in 2015 say they consider climate change a very serious problem, virtually unchanged from the 49% who said the same in 2010. Although there has been little change overall, there have been significant declines in concern in several key economies. In China, the world’s greatest emitter of greenhouse gases, the number of people saying climate change is a very serious problem has decreased by 23 percentage points since 2010. Double-digit decreases also occurred in a number of other large carbon-emitting countries, including South Korea (-20 points), Japan (‑13) and Russia (-10). France (+10) and the U.S. (+8) have seen modest but notable increases in concern about climate change since 2010. More broadly, a country’s carbon emissions are correlated with concerns about global climate change. (Overall climate change concern is measured using a three-item index. For more information see Appendix.) In nations with high levels of carbon emissions per capita, including the U.S., Australia, Canada and Russia, publics are less likely to express strong worries about climate change. The U.S., with the highest per-capita carbon emissions of the nations surveyed, is among the least concerned about climate change and its potential impact. Publics in Africa, Latin America and Asia, many of which have very low emissions per capita, are frequently the most concerned about the negative effects of climate change. While much of the current climate change debate focuses on curbing future carbon emissions, a median of 51% across the nations surveyed believe that climate change is harming people around the world now. Roughly eight-in-ten say that global climate change currently impacts people or will do so in the next few years, compared with a median of just 13% who say that climate change will not impact people for many years or will never affect people. As with concern about climate change more broadly, Latin Americans express the greatest unease about the immediacy of the climate change threat. About three-quarters (77%) say climate change is harming people now. Roughly two-thirds or more in every Latin American nation surveyed say the detrimental effects of climate change are already being felt by people around the world. Brazilians (90%) are the most likely to believe that climate change is harming people now. This strong public support, as well as international pressure, likely contributed to Brazilian President Dilma Rousseff’s recent pledge to cut the country’s carbon emissions 37% by 2025. While Europeans are less likely to say climate change is a very serious problem, a median of 60% believe that it is negatively affecting people now. Germans (66%) are most likely to say global climate change is harming people now, followed closely by Italians (65%). As with concern about climate change, Poles are among the least worried: Just 28% believe it currently affects people. In Africa, a median of 52% say climate change is harming people now, and 86% say it is either harming people now or will do so within the next few years. About three-quarters of residents of Burkina Faso and Uganda think climate change is currently affecting people. However, just 33% of Ethiopians and 31% of South Africans agree. Americans are among the most likely to believe that the effects of climate change are a long way off. While 41% report that climate change is already harming people around the world, 29% believe that it will not harm people for many years or may never harm people, the greatest sentiment of this kind in any nation polled. With a median of 26%, Middle Easterners are the least likely to believe that climate change is currently harming people. Lebanese (40%) are the most likely in the region to say that climate change is detrimentally affecting people. Palestinians (23%) are the least likely to say the same. Globally, half or more in 39 of 40 countries are concerned that climate change will harm them personally in their lifetime. And 40% say they are very concerned about this prospect. Opinions, however, vary substantially by region. Latin Americans are among the most alarmed – 63% say they are very concerned that climate change will impact them personally. Brazilians (78%) are particularly concerned about the personal effect of climate change, but majorities in all of the Latin American nations surveyed say the same. Similarly, 61% of sub-Saharan Africans, many of whom are especially vulnerable to the effects of climate change, report being very concerned about the impact it will have on their own lives. Roughly nine-in-ten (88%) in Uganda and about three-quarters of the public in Burkina Faso (77%) and Ghana (73%) are very concerned about the personal threat posed by climate change. Views on this issue may reflect what people are experiencing in their daily lives. Over the past several years, both Uganda and Burkina Faso have experienced severe flooding. And desertification – the extension of the Sahara into the Sahel region – in Burkina Faso has displaced thousands. Reports suggest that nearly 30% of households in Burkina Faso’s Sahel zone have relocated over the past 20 years due to changes from global warming. As in Africa, nations in the Asia-Pacific region that are particularly vulnerable to the effects of climate change are among the most concerned about its personal impact. The Philippines, ranked second-most at risk from climate change in a recent United Nations report, reports the greatest concern about the personal toll of climate change among the Asian nations surveyed. Three-quarters of Filipinos say they are very concerned that global climate change will harm them over the course of their lives. Australians (18%) and Chinese (15%) are less worried about the personal impact of climate change. Publics in nations likely to be less vulnerable to the effects of climate change, according to the UN’s World Risk Index, generally reflect less concern. Three-in-ten or fewer in the U.S., Europe (median of 27%) and the Middle East (median of 27%) express serious concern about the personal effects of climate change. In a number of European nations, concern about climate change and its current impact is more pronounced for those on the left of the political spectrum. For instance, in France, 70% of those on the left express very serious concerns about climate change, compared with just 49% on the right. Very similar ideological divisions occur when the French are asked whether climate change is harming people now: Those on the right are significantly less likely to say climate change is currently affecting people. Substantial ideological differences on the threat and impact of climate change, which frequently mirror partisan divisions on the topic, also exist in Italy, the UK and Spain. Only in Poland are those on the right more likely to believe that climate change is harming people now. 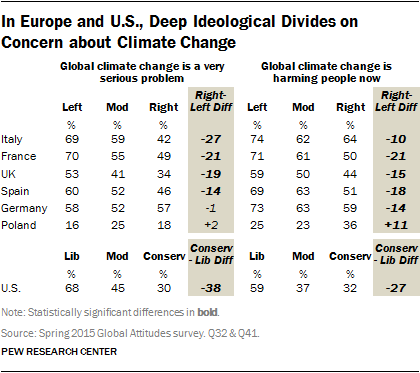 Much as in Europe, ideology affects Americans’ perceptions about the threat of climate change. Roughly seven-in-ten self-identifying political liberals (68%) consider climate change a very serious problem, while just 30% of conservatives say the same. This ideological gap has widened slightly since the question was last asked in 2010; then, 53% of liberals and 23% of conservatives expressed grave concerns about global warming. Liberals (59%) are also significantly more likely to believe that climate change is harming people now, compared with just 32% of conservatives. Ideology is only one of the prominent demographic differences in American views on climate change. In the U.S., women, young people and those with lower incomes are most likely to voice concern about climate change and its effects. Roughly half of American women say global climate change is a very serious problem, compared with 39% of their male counterparts. Women are also more likely than men to believe that climate change is harming people now and that its effects will personally harm them at some point in their lives. Younger people are more likely than those ages 50 and older to express concern about the threat of global climate change and its effects. About half of Americans ages 18 to 29 and 30 to 49 say climate change is a very serious problem while 38% of their elders say the same. 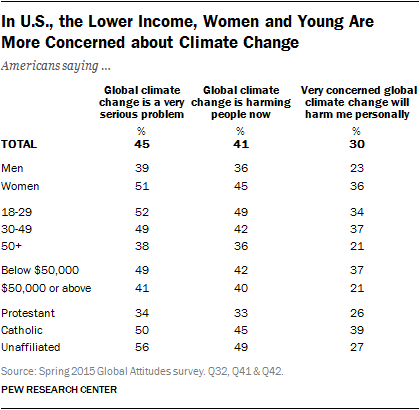 Americans’ views on global warming also diverge along religious lines. Catholics and those unaffiliated with a religion are more likely than Protestants to believe that climate change is a very serious issue and that it is negatively affecting people now. However, a recent Pew Research Center report shows that political partisanship and race/ethnicity may be better predictors of environmental attitudes than religious affiliation. Across the nations surveyed, the threat of droughts or water shortages is the most troubling potential effect of global climate change – a median of 44% say they are most concerned about this possibility. A quarter consider severe weather, including floods and intense storms, the most threatening effect of climate change. Far fewer cite long periods of unusually hot weather (14%) and rising sea levels (6%) as their top concern. About six-in-ten Latin Americans (median of 59%) list drought as their primary worry when it comes to potential byproducts of climate change, and it is the top concern in every Latin American nation surveyed. Fears about drought are overwhelming in Brazil (78%), where water shortages caused widespread anxiety this past summer. Similarly, 72% of Venezuelans express serious concern about drought. Sub-Saharan Africans voice similar levels of worry about drought – 59% cite it as the most concerning potential effect of global climate change. While a median of just 18% in the nine nations surveyed there say severe weather is the biggest concern, it is the top issue in South Africa (31%). In Nigeria, extreme heat (38%) is the most troubling effect of global climate change. While drought (median of 41%) is still the predominant climate change-related concern in the Asia-Pacific region, worry about severe weather (median of 34%) follows close behind. In Japan, where people experienced a devastating earthquake and tsunami in 2011 that killed nearly 16,000 people, 45% say severe weather is the most concerning effect of global climate change. Malaysians and Pakistanis also cite severe weather as their top climate-related anxiety. About one-in-ten or fewer in the Asia-Pacific region worry most about extreme heat (13%) and rising sea levels (6%). Roughly four-in-ten Middle Easterners name drought (median of 38%) as their top climate change concern, including a majority in Lebanon (56%). In Turkey, people are relatively split on their top concern – 35% of Turks say drought is the most concerning, while an equal share cites severe weather. Among Israelis, opinions are relatively split between the threat of drought (29%), extreme heat (26%) and severe weather (23%). While Europeans express similar worries about drought (median of 35%) and severe weather (27%), they are among the most likely to consider rising sea levels (15%) the greatest threat when compared with other regions. 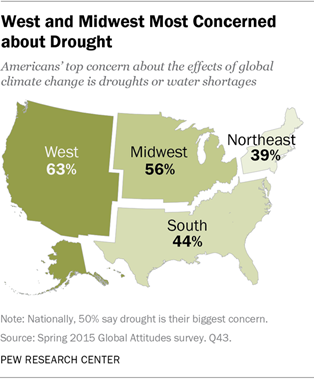 Half of all Americans view drought or water shortages as the most concerning impact of global climate change. Those from the Western (63%) and Midwestern U.S. (56%), both of which have experienced substantial water shortages over the past few years, are especially likely to name drought as their top worry. Americans share similar levels of concern about rising sea levels (17%) and severe weather (16%). About one-in-ten (11%) are concerned about extreme heat.